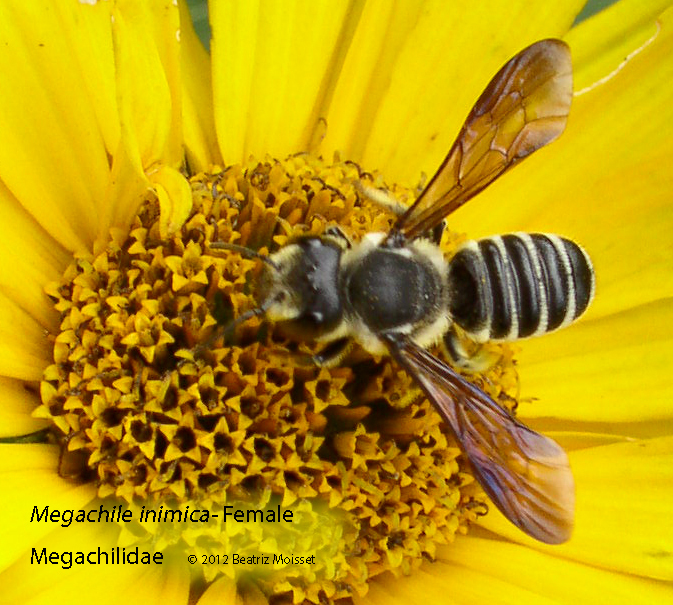 The bees of the family Megachilidae include the leaf-cutter bees and the mason bees. 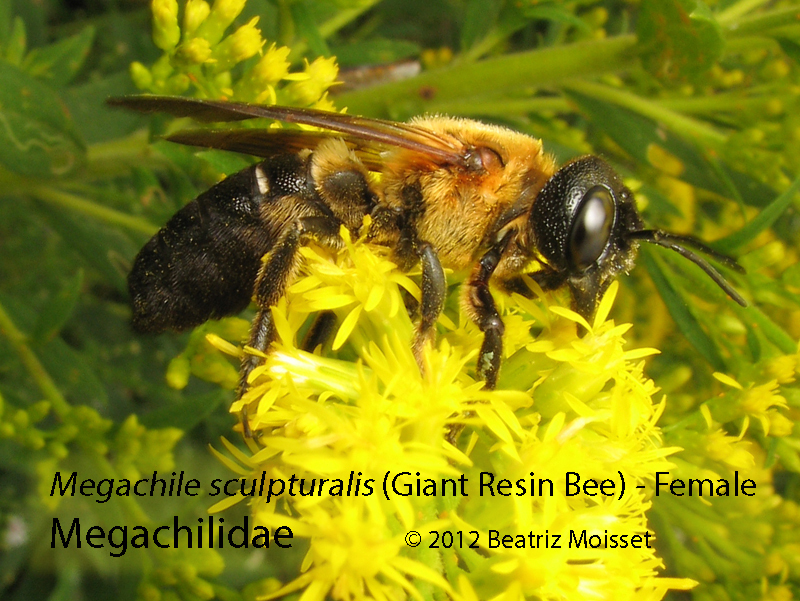 They have big powerful jaws, which is what Megachilidae means. 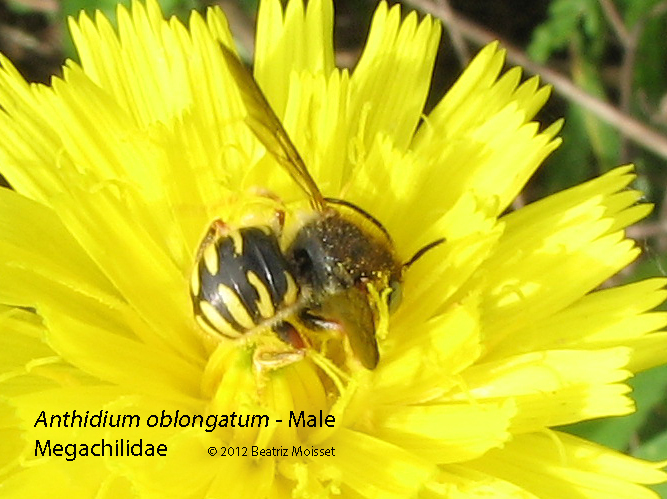 There are a number of bees that carry pollen under their bellies, rather than on their hind legs. 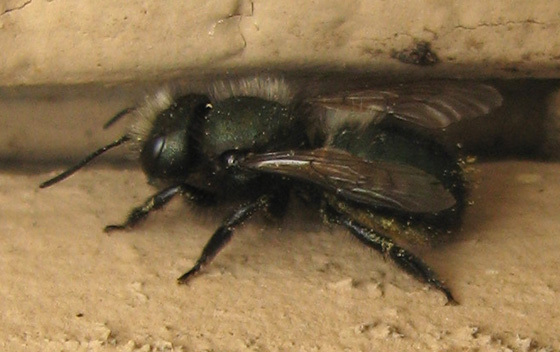 They are called mason bees and leaf cutter bees because of their nesting habits. Most of them use cavities, either hollow twigs or holes in wood, perhaps made by beetles or some other larvae. 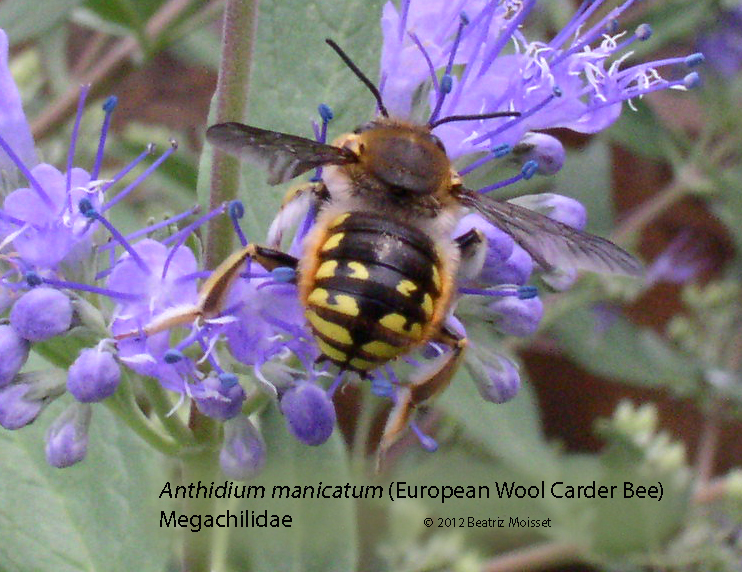 They are about the size of honey bees. 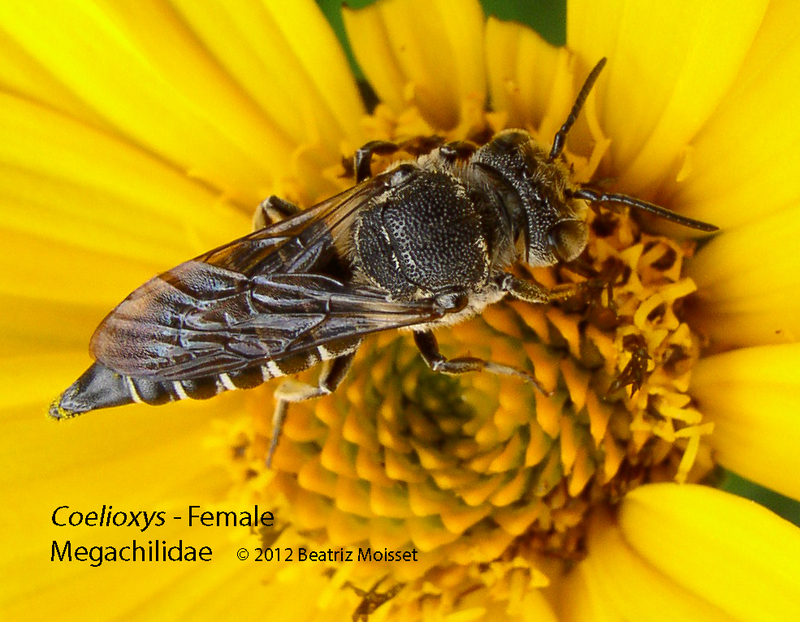 The most distinctive feature of the females is the hairy underbelly, or ventral part of the abdomen. This hairy brush is called a scopa; when it is loaded with pollen it is very visible and its yellow color is in sharp contrast with the dark color of the bee. 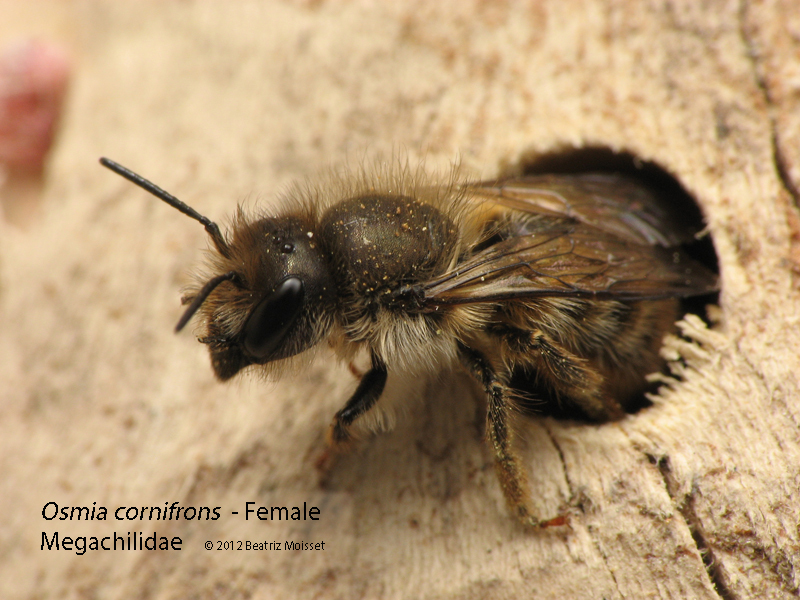 Mason bees use clay to build walls inside the hole, separating the individual cells where one egg is stored. 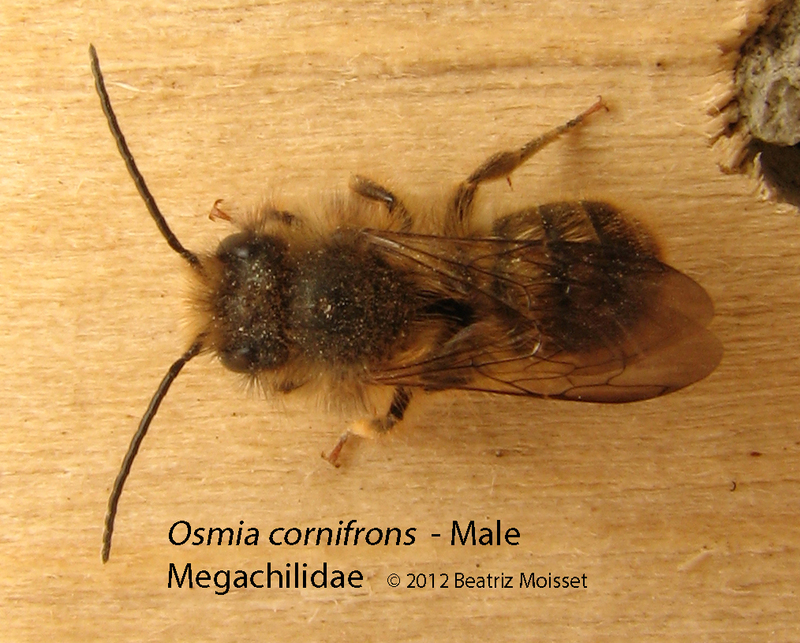 The mason bee, Osmia, is dark, almost black, or with some metallic blue. It is easy to raise them in bee houses that you can either buy or build yourself. 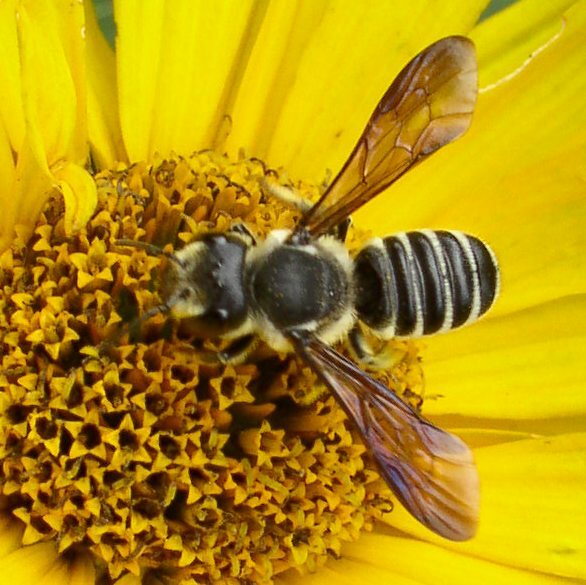 Leaf cutter bees use pieces of leaves for the same purpose. You may have seen the neatly cut round holes in leaves. They seem to have a preference for rose bushes, but they also use other plants. 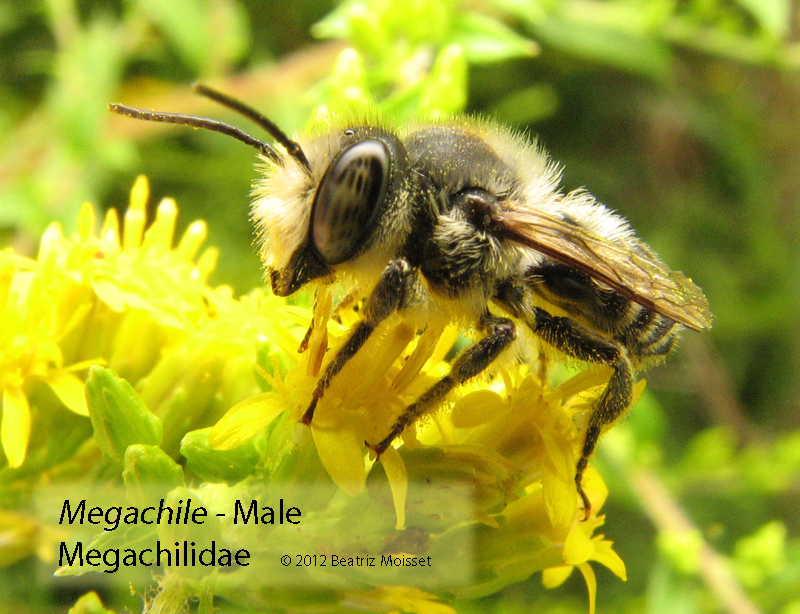 The leaf cutter bee, Megachile, is about the size of a honey bee and black; the abdominal segments are very marked. Its posture is very characteristic. When resting, it bends its abdomen upward. Season. 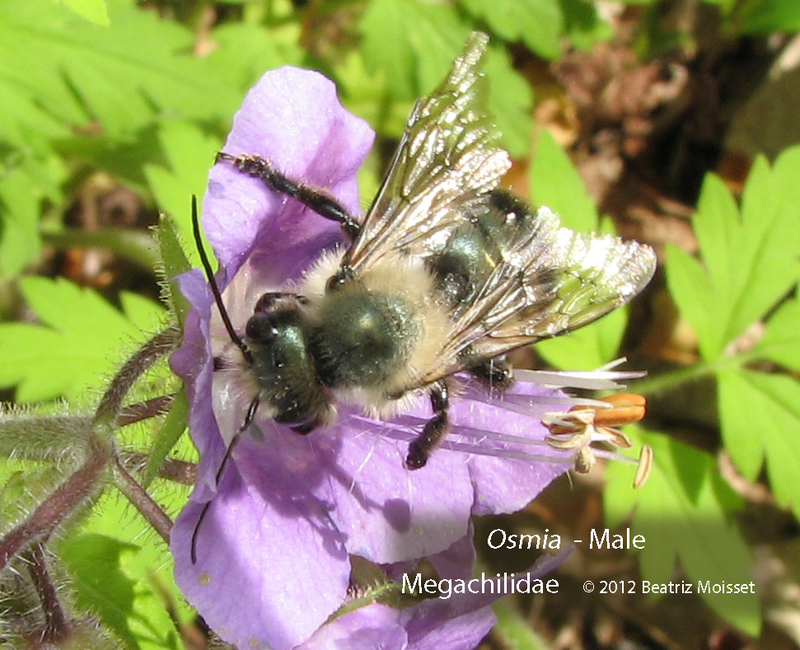 The mason bee is active in April and May, although a few are seen earlier and later than this, even into early fall, especially in southern states. 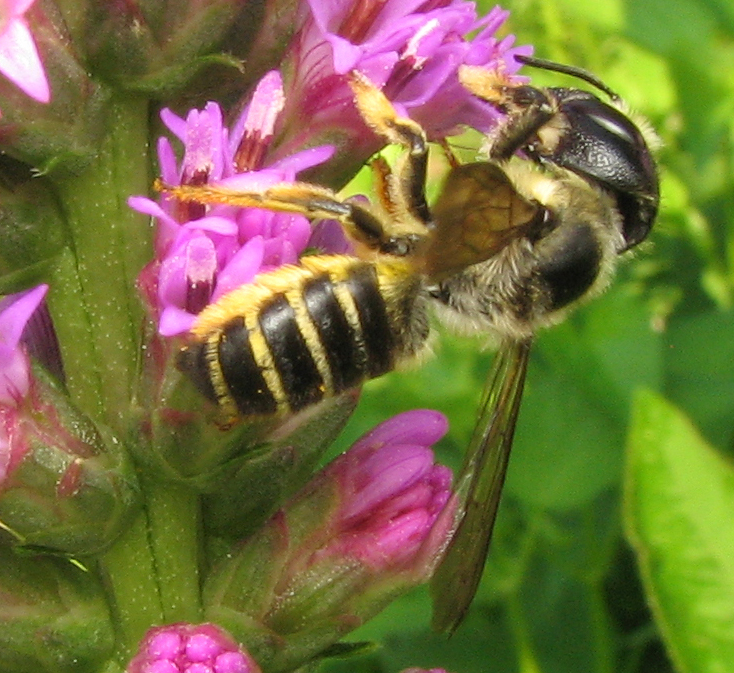 The leaf cutter bee is seen in spring and summer and even into the fall. It is most active between June and September. Flowers. 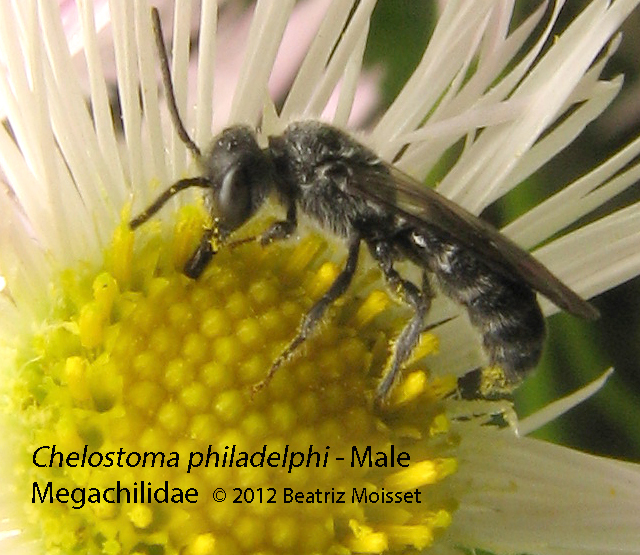 The mason bee is busy in the spring, so it is often seen in dandelions, red buds, and on the flowers of several types of berries. 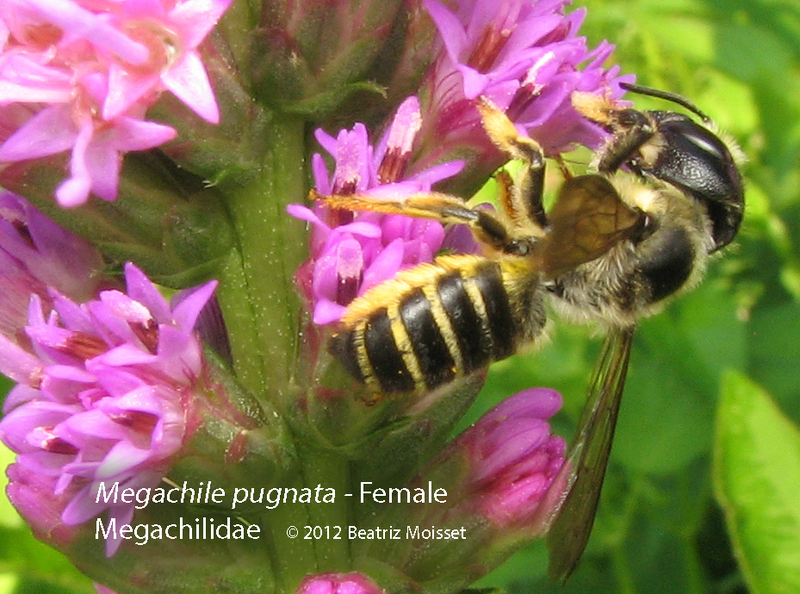 The leaf cutter bee has a longer season and also visits summer and fall flowers: asters, thistles, cone flowers, goldenrods. 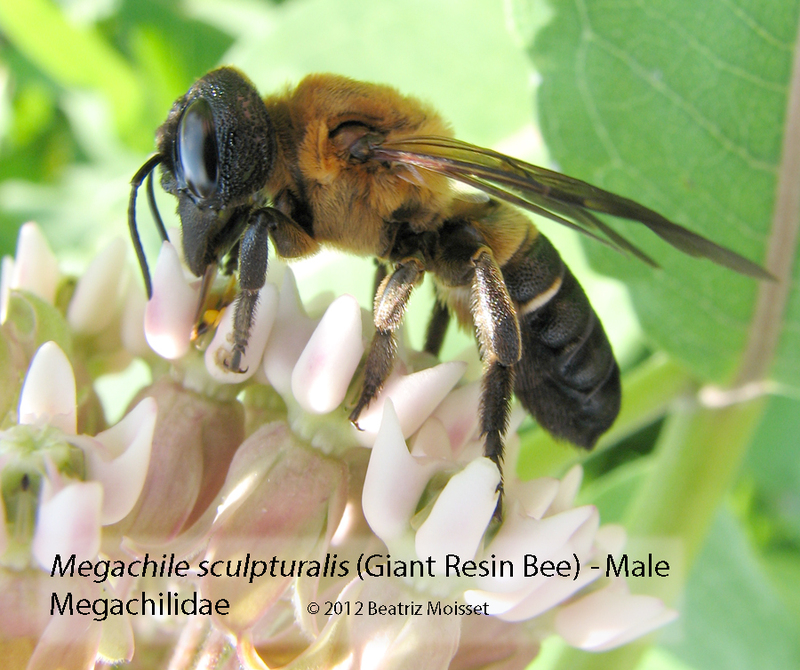 You are currently browsing the archives for the Megachilidae category.